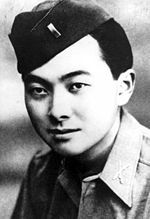 I hadn't read up on exactly what Daniel Inouye was doing when he lost his arm in World War II, but it's a completely incredible story. He's leading his guys to attack these German machine guns and he gets shot in the stomach by a machine gun and then he destroys one machine gun nest and then leads his men to destroy another machine gun nest and then gets his arm smashed by a grenade and pries his own grenade out of the smashed arm and throws it with his good arm to destroy the last German machine gun nest and then shoots Germans and gets shot again in the leg and falls down and regains consciousness and when his men rescue him he orders them to keep fighting. And then he lived to be 88. Apparently he picked Rep. Colleen Hanabusa to be his successor in the Senate, who sounds like a good choice to me. Ed Case, meanwhile, should not under any circumstances be chosen. I think the format is that the state party nominates three people and the Governor chooses one of them, which sounds like a perfectly reasonable format. Update: It looks like the three party nominees are Rep. Hanabusa, Lt. Gov. Brian Schatz, and state Land and Natural Resources Director Esther Kiaaina. I assume that this leads to Hanabusa's ascension, but you'd have to ask someone who knows Hawaii politics better to be sure. Update 2: Surprise! It's Lt. Gov Brian Schatz. I don't know where things go from here in Hawaii politics, especially as regards the 2014 Senate general election. The best part is when he comes to, and yells at his men for standing around because the war isn't over or something. DUDE YOU'RE MISSING AN ARM AND YOU NEARLY BLED TO DEATH.